Migraine sufferers know that it is important to act at the first sign of an attack to help provide relief. 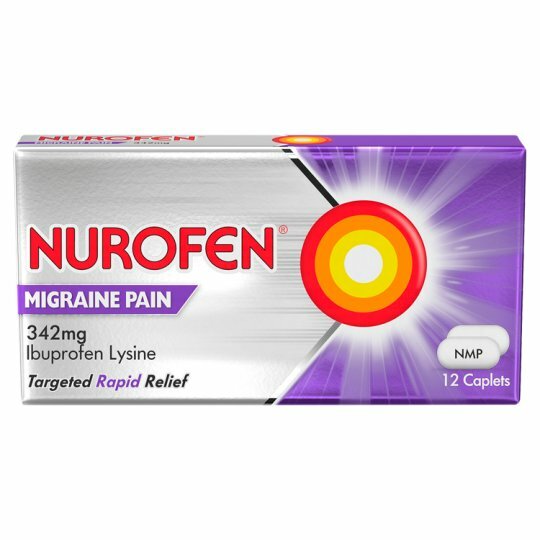 That's why we provide Nurofen Migraine Pain. It contains Ibuprofen Lysine, which is quickly absorbed in the body to help provide relief from headache and migraine Pain. For oral administration and short-term use only. Store below 25ºC., Store in the original pack. Adults, the elderly and children & adolescents between 12 and 18 years: Swallow 1 or 2 caplets with water up to three times a day as required. Leave at least 4 hours between doses. Do not take more than 6 caplets in any 24 hour period. Children and adolescents between 12 and 18 years: If the product is required for more than 3 days, or if symptoms worsen a doctor should be consulted. Adults: If the product is required for more than 10 days, or if symptoms worsen a doctor should be consulted. DO NOT TAKE IF YOU: Have (or have had two or more episodes of) a stomach ulcer, perforation or bleeding Are allergic to ibuprofen or any other ingredient of the product, aspirin or other related painkillers Are taking other NSAID painkillers, or aspirin with a daily dose above 75mg Are in the last 3 months of pregnancy SPEAK TO A PHARMACIST/DOCTOR BEFORE TAKING IF YOU: Have or have had asthma, diabetes, high cholesterol, high blood pressure, a stroke, heart, liver, kidney or bowel problems or are dehydrated Are a smoker Are pregnant WARNING: Do not take more medicine than the label tells you to. KEEP ALL MEDICINES OUT OF THE SIGHT AND REACH OF CHILDREN.